India-Monco Business Forum with Prabhu and Prince Albert II. India-Monco Business Forum with Prabhu and Prince Albert II and delegates. Commerce and Industry Minister Suresh Prabhu has invited Monaco industries to invest in the Indian services sector which is expected to contribute US$3 trillion to India’s GDP once it is a US$5 trillion economy in the next 5-6 years’ time. 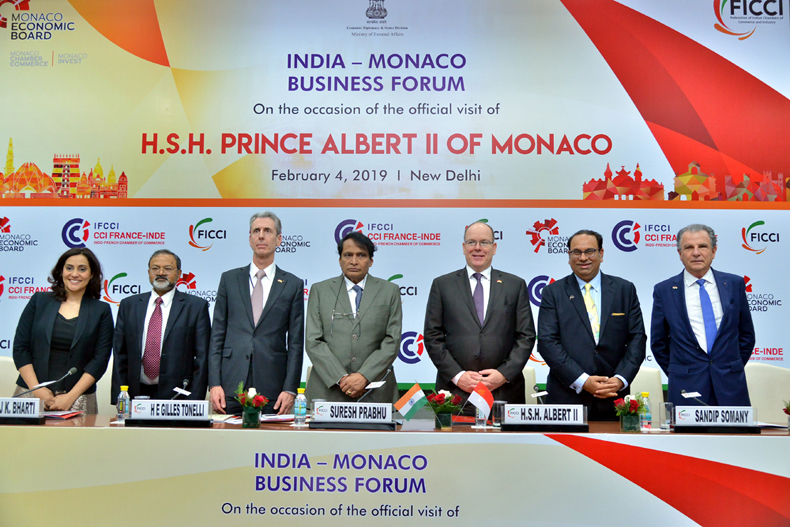 “The government has already identified 12 champion sectors in services namely banking and finance, tourism and hospitality and healthcare services… and we want Monaco to take advantage of this,” Prabhu told delegates at the India Monaco Business Forum held in New Delhi. Prabhu also sees India and Monaco jointly work in developing technologies to mitigate environmental concerns. Monaco Foreign Affairs and Cooperation Minister Gilles Tonelli highlighted the opportunities present in Monaco and invited the Indian companies to capitalize on the Government’s safe and sound industry-oriented policies. A ‘Partnership Agreement’ was signed between FICCI and Monaco Economic Board (MEB) and the Federation of Indian Chambers of Commerce and Industry to strengthen the institutional relations between the two countries for further increasing trade and economic relations. MEB Chairman Michel Dotta pointed out that Monaco can act as a gateway for Indian companies venturing into Europe. FICCI President Sandip Somany suggested that India play a valuable role in fostering the rich potential of Monaco’s tourism industry. He added that Small and Medium Enterprises (SMEs) are important areas for both India and Monaco, especially in the field of consumer chemicals and petrochemicals as well as in the production of plastics and electronics. Collaborative work with the Indian counterparts can certainly be looked at.